In 2015, Inc.com’s contributing editor, John Brandon, predicted the death of email, saying it would become obsolete by 2020. It’s the end of 2018, and no one is cancelling their email accounts. What Brandon and other futurists didn’t understand was that a collection of chat applications is no substitute for the universal reach of email. There’s zero chance either of those will ever happen. Everyone has an email address, but not everyone uses Facebook Messenger, Twitter DMs, or Slack. And cross-platform compatibility simply isn’t on the product roadmap for any of these services. There will never be a day when I send a note from Facebook Messenger and my friend receives it in a Twitter DM. That’s just not the way the services are designed to work. The closest thing we have to cross-compatibility is SMS text messages, which require you to know the other party’s personal phone number. In business contexts and many personal situations, that’s an impractical option. Since cross-compatibility isn’t going to happen, there’s only one way any app could become an “email killer”: universal adoption. Apple, Facebook, Twitter, and Slack are the very companies with products that could—in theory—be replacements to email. And what’s worse, none of those companies seem able to avoid the PR disasters that wreck any chance they’d have at gaining universal usage. There was a time when some believed Facebook Messenger was the app that would kill email. Facebook—with its 2.27 billion active users—was better positioned than any other company on this list to achieve near-universal usage. Facebook has had several PR stumbles in the area of privacy. 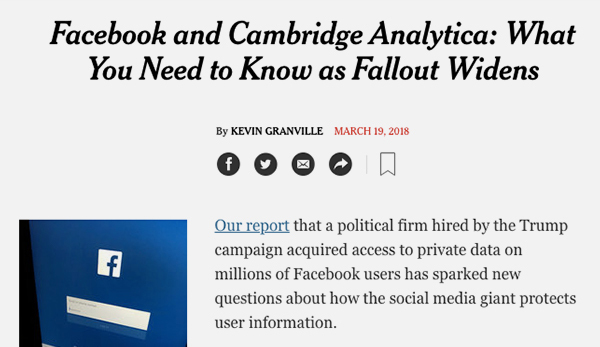 Perhaps none has been as big as the Cambridge Analytica scandal that broke in early 2018. Cambridge Analytica, a firm hired by the Trump campaign, gained access to the data of more than 50 million Facebook users. But the damage was done, causing a series of inquiries. Those inquiries included a trip to Capitol Hill for Mark Zuckerberg. Facebook’s privacy policies have come under scrutiny several more times this year. In December, Twitter founder and CEO Jack Dorsey was criticized as being “tone deaf” for his comments about Myanmar, where he was visiting. Dorsey also testified to Congress in the fall after accusations of political bias at the company. Perhaps the most difficult PR story of the year for Silicon Valley has been the death of Jamal Khashoggi in Turkey. The CIA concluded that Khashoggi’s deathSaudi Arabian Crown Prince Mohammed bin Salman likely ordered the Khashoggi’s killing. The crown prince has been an active and vocal backer of many U.S. technology companies. The killing has shined a light on the flow and impact of investment money from Saudi Arabia, including funds with ties to the royal family. Companies such as Slack, WeWork, DoorDash, and Nvida have largely remained quiet in the fallout from the apparent killing of the Wall Street Journalist. For all the reasons we saw in 2018, we can confidently predict that no chat or social media platform will ever achieve 100% adoption. For that reason, there will always be a need for a professional messaging application that’s cross-platform compatible with a variety of different service providers. It’s been with us since 1972. And it’s going to be with us for many decades to come. This is why—instead of trying to kill email—we’re building tools that make email far more productive. We built over 50 of them so far, and most are 100% free! We invite you to try them out. We sometimes act like our email is a permanent resource for us to keep some of our most valuable information. There are SO many ways you could potentially lose access to your account. Perhaps you work in sales, and your history and contacts are extremely important to you. But if you change companies tomorrow, you could lose everything. Hackers are everywhere too, and they often target Google accounts, as we’ve been reminded again recently. This is why you should consider creating a backup for your emails in case something ever happens. Once you set it up, you’ll feel a whole lot better. Go the Chrome Store and download cloudHQ’s Chrome extension Save and Backup My Emails. After you installed “Save and Backup My Emails”, a button should appear on the top of your inbox main home page called “Backup all emails”. cloudHQ will start saving all of your emails in PDF format to make it easy for you to search through them when you need to. This also includes any attachments or conversation threads, too- so it’s a really thorough solution. You’ll get an email from cloudHQ when we’re done saving all of your emails to PDF (usually a few minutes to a few hours depending on how many emails you have) , where you can download them to your USB key or your computer’s hard drive, and actually have the satisfaction of knowing that your information is literally in your hands. I can’t stress enough how important it is for you to keep your emails in a separate location than your inbox. All of this can be done in just 2 clicks using the Save and Backup my Emails extension and completing the instructions above. We pay a lot of attention to workplace trends at cloudHQ. They drive our strategy as we develop services and create free productivity tools. For years people have predicted the demise of email. The original “unhappy customers tell 9-10 people about their experience” idea comes from a study commissioned by Coca-Cola in the late 1970s. As business author Allan Kimmel wrote in his book, research firm TARP surveyed 1,700 Coca-Cola customers who contacted customer service for any reason. TARP found that customers who were dissatisfied with the experience told a median of 9-10 people. The study was circled widely among marketing circles, turning the “9-10 people tell their friends” idea into dogma. It’s not the late 70’s anymore. Customers have incredible power to damage a company’s reputation (and revenue). Consider the case of “United Breaks Guitars,” a song written by musician Dave Carroll. Carroll wrote it after United Airlines broke his $3,000 Taylor guitar, then repeatedly rejected his compensation claim. In the age of social media, customers tell far more than just 9-10 people about their negative experiences. That means you need to have solid processes in place for responding to customer complaints, including email campaigns. Speed is the key to making frustrated customers happy again. The faster you fix problems, the happier your customers will be. To move with speed, here’s a simple method you and your team can use to respond quickly and effectively to customer service emails. 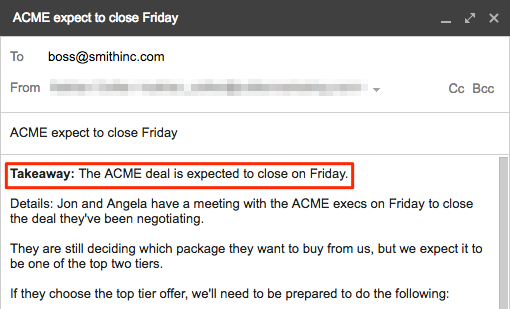 It uses red, yellow, and green Gmail labels to prioritize messages, allowing your team to respond to urgent (and potentially damaging) customer messages quickly. Create and share labels for “red,” “green,” and “yellow” emails. Everyone on your team will need access. Then simply sort messages by labeling them as you receive them. Once you have the labels set up, everyone on your team can work through them by their priority. If someone’s not sure what to respond, your team can comment on emails with each other before replying back to the customer. Most customer complaints won’t reach 15 million people. But the average Facebook user now has at least 338 friends. That’s a far greater reach than the 9-10 people from Coca-Cola’s study 1970s-era study. Responding to emails using a simple red, yellow, green priority method ensures you deal with angry and urgent complaints first, then move on to the less urgent ones. That’s good for your customers, good for your reputation, and (most importantly), helps you keep your company from being the target of a “United Breaks Guitars”-style PR disaster on social media. All it takes is some planning—and the free Gmail Label and Email Sharing Chrome extension. Email continues to be the most-used communication app in the world, especially in business settings. If you want people to love working with you, getting really good at email is a great first step. Make your emails short—less than 100 words if possible. And keep each message to just one topic or idea. If you have two things you need to say to someone, say them in two separate (short) emails. If you must write a long email, add a one-line summary of the big takeaway at the beginning of the email. That way your reader can get the big idea you want them to know, even if they don’t have time to dive into the details. Journalists aim for a 6th-grade reading level when writing. That doesn’t mean they’re dumbing down the information. It just means they’re communicating with language that’s easier for their readers to understand. The next time you write an email, save it as a draft before you send it. Then copy and paste your message into Hemingway.com. Hemingway will give you a reading level score, and it will highlight where your writing is convoluted and difficult to understand. 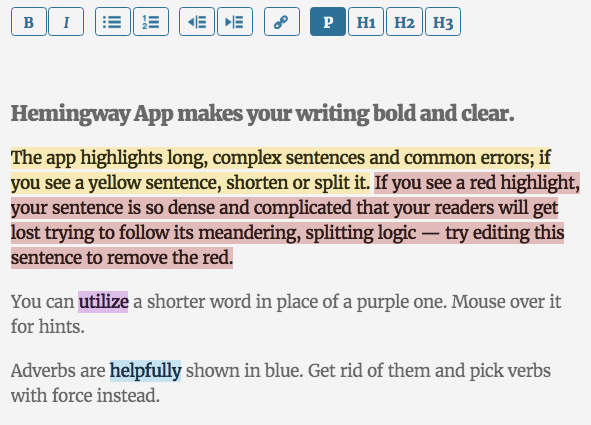 To lower your score, shorten your sentences, add paragraph breaks, and replace long words with shorter alternatives. To improve your writing, just keep revising until all the red and yellow are gone. Most people can’t proofread their own work. We get too close to it to catch the typos, misspellings, and dropped words. These little grammar errors may not be the end of your career, but they don’t give a great impression. They can be especially embarrassing if you regularly send emails to executives, customers, or sales prospects. The Grammarly Chrome extension can help you find many of these errors. It’s like having grammar check in your browser, except much more accurate. Writer Dan Pink includes a full section on email subject lines in his book To Sell Is Human: The Surprising Truth About Motivating Others. His discussion centers on prospecting emails, but the same principles apply for any subject line you write, no matter the audience. You’re a professional. You should be using a professional email address. If you must use a free email, use a Gmail address. Right or wrong, Yahoo, Hotmail, and AOL emails are all perceived as being outdated in the professional world. Some hiring managers even penalize job prospects with “unofficial demerits” for submitting applications anything other than Gmail when submitting a job application. Don’t make people work to find your contact information. Your signature block doesn’t have to be fancy. But you should include one in every email you send—including replies and forwards. That way if someone wants to call, they won’t have to go digging for your phone number. People often scan through email—just like they do web pages. If you bury an action-item request in the middle of a dense paragraph, they might miss it. Instead, separate action items with formatting tricks like bullets, bolding, and whitespace. We love being connected. But many of us hate the constant onslaught of requests, interruptions, and outstanding to-do actions our email represents. When you can, try adding the line, “no action required” at the bottom of your message. It’s a sure way to bring a smile to a busy professional’s face. They may respond anyway just to say thanks. But they’ll appreciate that you made it clear they didn’t have to. Sarcasm is usually communicated through body language and tone of voice. Neither of those things comes through in email. That’s why sarcasm risks being misinterpreted as bitterness or anger when read by the person on the other end of your email. Even if you’re emailing a friend who knows you well, emails have a way of getting forwarded around organizations. You never know who’ll eventually read a message you intended to be sarcastically funny—but instead came across as rude, dismissive, or insulting. If your organization provides your email address, they have the right (and the ability) to read anything you send from that address. Even if you paid for your own server and set it up in your house, you can’t assume those emails will always remain confidential either. Don’t write anything in email you wouldn’t want to be published on a news site with your signature under it. Getting good at email is like getting good at networking. It’s a skill that can provide major dividends for your business—and your career. We mentioned earlier that you really should have a professional email—or at least a Gmail address. If you don’t already have a Gmail address, you can grab a free one here with just a few clicks. For those of you already using Gmail, we invite you to try a free productivity tool from our growing list of Chrome extensions—which are each designed to help you work better (and faster) within Gmail. It happens to all of us sometimes. Ironically, having too much to do can easily sap you of your motivation to do much of anything. Take a long look at your to-do list. Does everything there truly have to get done today? Usually, there are lots of things on your list that you badly want to get done, but that could stand to wait a day or two. Go through your list, pick the top three things you have to do, then work only on those tasks. If you get them done, you can go back to your longer list and work on other items. Multi-tasking is almost always less efficient than working on a single task at a time. Except for automatic tasks like walking or chewing gum, your brain only has enough energy to focus on one thing at a time. When you try to do two things at a time, you’re not actually doing two things at once. Instead, you’re switching back and forth, entering each task for only a few seconds. The research on this is pretty clear. Multi-tasking well is a myth. No matter how many items are on your to-do list, it’s better to attack one task at a time—and block out everything else. A University of California Irvine study found it took an average of 23 minutes for knowledge workers to get back on track after an interruption. That’s why it’s so important to shield yourself from distractions, especially if you already feel overwhelmed. Remember to mute or turn off desktop, browser, and mobile notifications for a few hours. Be realistic about how many hours you have in your day. Take your top tasks and put them on your calendar, just like you do with meetings and appointments. Then stick to your calendar, no matter what. This will give you a realistic view of what you have to get done. And with practice, you’ll get a better sense of how long your tasks actually take. Protect your time and energy. When you’re overwhelmed, say “no” to every request you can. Be polite, but be firm. Short breaks can recharge your ability to focus. A University of Illinois study found performance and attention dropped noticeably after focusing on a single task for a long time, but a small break can help you refocus. Try to unplug every 90 minutes or so. Get up and stretch your muscles. Or take a 10-minute walk around the building. Going with a friend is even better since you’ll get a little social interaction along the way. If you’ve prioritized, scheduled, and focused, but you still have far too much to do, it’s time to ask a boss, co-worker, or friend for help. Your supervisor, in particular, needs to know if you’re falling behind. Most supervisors genuinely want to help. And they might have access to resources you aren’t aware of. At the very least, they should be able to help you decide what tasks are truly important— and which ones can wait. When you’re already stressed out, losing 10 minutes searching your inbox for a client email can be maddening. Same thing if you’re trying to find the latest version of a file saved somewhere in your cloud storage. Before things get overwhelming, put some systems in place to help you stay organized. Make some time to set up a workflow system that make life easier. For example: automatically backup all your cloud storage files, so that you know they’ll be there when you need them. The next time things get crazy, you’ll be glad you organized a plan. Clutter in life leads to clutter in your thinking. It’s true for digital clutter just like it is for physical clutter. Pick an area of your computer you know is a mess. For 10 minutes, delete anything that’s old, outdated, or no longer relevant to your work. You’ll usually find three or four files that are giant compared to the rest of the files in that folder. You might need to keep the giant files, or you might be able to delete them. Either way, you’ll be evaluating the biggest files. This is a great way to free up storage space and improve the performance of your computer overall. Despite the popularity of Slack and a dozen other messaging apps, email isn’t going anywhere anytime soon. If your inbox is home to hundreds or thousands of emails, it might be time for a massive one-time archive of all your messages. Maybe. But what do you have to lose? All your messages will still be available in your archive if and when needed. At the worst, you might have to keep three or four emails from the last day or two—messages that require some type of action. Keep those. Archive the rest. Even better, make archiving email a daily or weekly habit. Then enjoy the peace of having a (mostly) empty inbox. The downloads folder is often a wasteland of downloads, updates, and other random files—all taking up valuable room on your disk. The download folder should be a temporary storage location, not a permanent archive. Move or delete anything that lives there. Also, if you’ve downloaded software from the internet, it’s almost always okay to delete the installation files. The software will still run on your computer, and if you need the installation files again in the future, you can just re-download them. The desktop tends to act like a “catch-all” storage location for many people. Screenshots, downloads, documents you pulled out of email, pictures from friends—these all have a habit of landing (and living) on your desktop for days. Take a look and see what’s there. If you don’t need it, toss it. Look at your shortcuts too. Have any you don’t use anymore? If you’re serious about decluttering your computer—but worried about deleting files you might need later—this is the solution for you. First, choose a cloud storage service where you’ll want to save just about everything (Dropbox, Box, Google Drive, etc.). Then use our backup sync service to keep all your other cloud services automatically backed up to your master cloud storage service. This can be done for one computer, multiple computers, or for everyone in your company. From that point forward, any file you place in a folder will be copied directly to cloud storage. This is a great way to create a permanent backup copy for yourself, your company, or your employees. It also means you can rest easy when deleting files from your local computer. If you need them, they’ll be easily available in the cloud. Decluttering your computer is good for your mind, your computer, and your productivity. It doesn’t have to take long to improve things. Take 10 minutes today and try one of these tips. We promise you’ll feel better because of it.